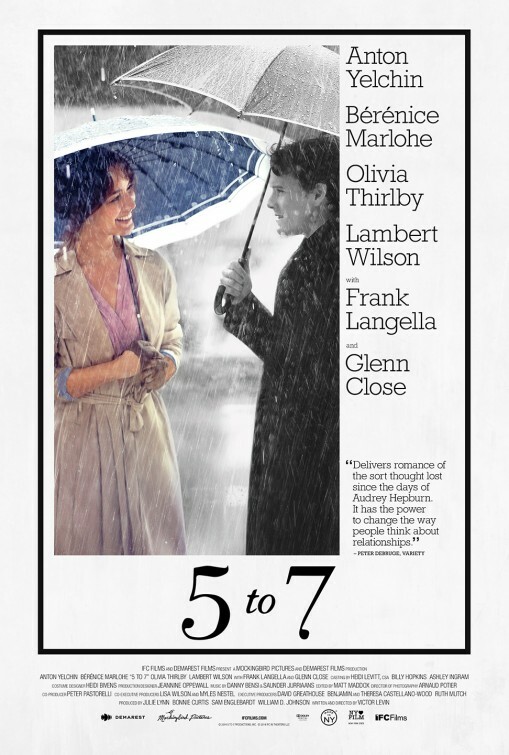 Written and directed by Victor Levin, 5 to 7 is a charming romantic drama set in New York in spring time. Anton Yelchin plays lonely and struggling writer Brian Bloom who one Friday casually offers a beautiful woman a light for a cigarette outside a swish Manhattan restaurant. The lady in question is the gorgeous former Bond girl, French actress Berenice Marlohe (Skyfall), who plays a diplomats young wife, Arielle. Soon Bloom is captivated by Arielle and she informs him that they can only see each other between 5 to 7pm in the evening. Surprisingly, Arielle’s husband Valery is played by Lambert Wilson and he even acknowledges his wife’s much younger lover. As the relationship develops so does their cultural exploration of each other’s different background, with Levin frequently comparing the best of French culture with the worst of American culture. Apparently in French society extramarital affairs are the norm as long as the respective mistresses and lovers obey the rules laid down before them. In Bloom and Arielle’s case this is a 2hour gap mainly in which they take in some of New York’s most beautiful sites including the Guggenheim Museum and Central Park along with some elegant Manhattan hotels including The St Regis and The Carlyle. Arielle is taken to meet Bloom’s doting parents expertly played by Glenn Close (Dangerous Liaisons, Meeting Venus) and Frank Langella (Frost/ Nixon, Grace of Monaco) who are slightly exasperated by their son’s romantic entanglement. Bloom, wonderfully played by Anton Yelchin even seeks the advice of Valery’s American mistress Jane played with tenacity by Olivia Thirlby (Juno, Dredd and No Strings Attached). As this romance runs its course, Bloom soon matures into an established writer after one of his short stories is selected for the prestigious literary magazine The New Yorker. Arielle naturally becomes Bloom’s writing muse and once the relationship starts to fade, he is forced to move on with a sort of nostalgic complicity which forces him to write his great novel, entitled The Mermaid. 5 to 7 is a charming Audrey Hepburn style romance seldom seen onscreen these days and more significantly is a sophisticated cinematic tribute to New York itself, which as a city has been the setting for many great romances including Autumn in New York and One Fine Day. Highly recommended viewing, intelligently written and beautifully acted. A rare cinematic treat to be cherished as much as the delights of the Big Apple itself.